Today marks an exciting new chapter in the development of the eSports market. Xsolla has officially launched a global international initiative called the Xsolla eSports Academy, providing a unique and cultivating environment for eSports enthusiasts worldwide looking to improve their skills and/or become qualified Coaches themselves. The Xsolla eSports Academy has a ton of new aesthetic and functional updates for gamers worldwide! Coaches, Schools (Pro Organizations), as well as Students can register for the Xsolla eSports Academy. Students can access the Coach Catalogue and browse the finest coaches around the world for their favorite games. Coaches can be added to the Coach Catalogue simply by filling out their profile and becoming a verified coach. Intuitive interface with the Xsolla eSports Academy video voiced none other than the Jon St. John AKA Duke Nukem. 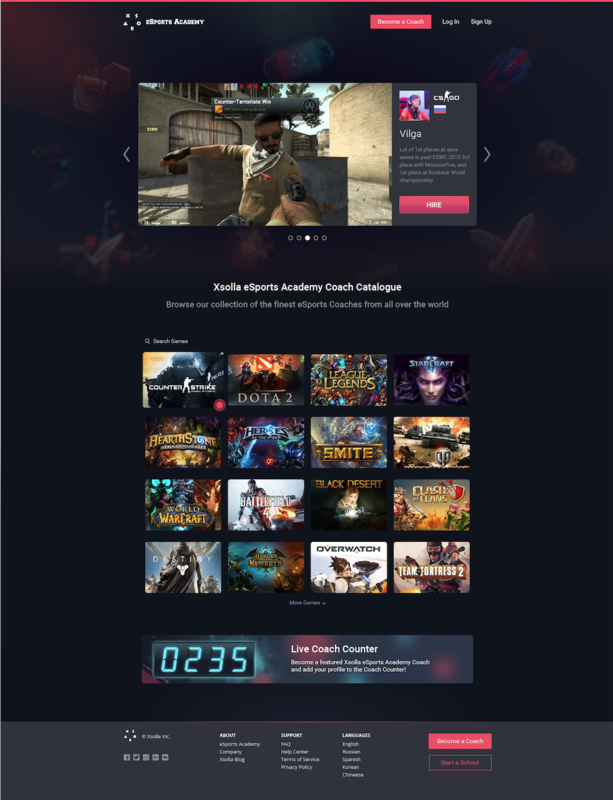 Students, Coaches, Schools will be directed here to login and access their account onto the Xsolla eSports Academy. Our backend has been upgraded to simplify the signup and editing process for Coaches to easily manage their accounts. Coaches have a simple process to link accounts, set their Coaching schedule, and upload highlight VODs which will help fill their profile. The Xsolla eSports Academy is a global project, so no matter where the Student lives or where the Coach is located, they can both connect via the Xsolla eSports Academy. The platform is available everywhere, thanks to the global payment coverage provided by Xsolla. It’s not limited to a number of games either and we have a growing list of top eSports games being added at the request of our users. The Xsolla eSports Academy also supports all popular eSports competitive projects. We have many exciting, insanely-skilled Coaches located worldwide just waiting to be booked by a Student for a session. One of our featured PRO Coaches include: PtitDrogo of mYinsanity for Starcraft II offering Coaching sessions for 20 Euros an hour (https://xsolla.academy/PtitDrogo/sc2). There’s also Axel “Haptism” Ri (https://xsolla.academy/Axel/lol) with 3 years professional coaching experience, currently Head Coach for Zenith eSports, Andrew “cncterm” Jun (https://xsolla.academy/term) who’s the master of Counter Strike: Global Offensive since the old days of 1.6, and Josh “Impact” Graham (https://xsolla.academy/Impact/hs) - a Hearthstone Professional Champion. For partner inquiries please send us a request.